If you can soak in Seetha maami’s wisdom, you are home! Our son studied at the University of Chicago. We have visited him on a couple of occasions when he used to live in Chicago. 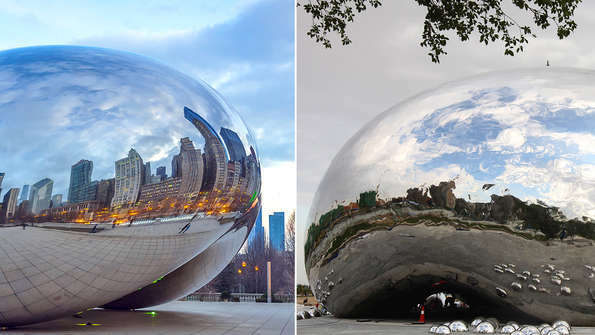 One of the many attractions of downtown Chicago is a sculpture in Millennium Park called “Cloud Gate”, nicknamed the Bean, by celebrated India-born British artist, Anish Kapoor. It’s a fun sculpture, though it is a very serious artistic creation too, for tourists because of its brilliant photo-taking opportunity – given its unique reflective properties. We have also been there in front of the Bean and shot our pictures as a family. So, I was rather intrigued to read in a recent issue of The Economist that a city called Karamay in western China was unveiling a sculpture very similar to Kapoor’s Bean later this month. This has apparently left Kapoor fuming. It’s a pity Kapoor is not getting what Emanuel has to say! I agree with Emanuel on this one. Because I come from the Osho school of thought. This whole lifetime of ours is spent in acquiring – from a name at birth to qualifications to wealth to patents to relationships to assets – only to give up everything when leaving this planet. So, this way, living in a forever-acquiring-mode, we are completely missing the essence of Life – which is to experience everything that comes to us or happens to us in Life. To be sure, you must never be serious about what you can never hold on to, what you have to lose any which way and what you can never save for use in another lifetime (as far as each of us experientially knows, there isn’t another lifetime; this is it!). There is no point in being so serious about what you own, what is yours and most of what you want to fight for. Even this lifetime is a gift – you didn’t ask to be born, did you? Your birth, as a (well-ordained, in most cases) human, is your biggest, priceless, gift. (And yet, imagine, so many sweat or sulk over material birthday gifts that money can buy!!!) By fighting silly battles with people and over issues that are inconsequential in the longer term of your definite-to-expire lifetime, you are squandering precious time. Last evening, our close friend Janaki, coincidentally, shared what her mother-in-law, Seetha, has told her in the context of Life. I believe it is pertinent to quote Seetha here: “I have gone to several cremation grounds over a period of time. What I have found is that nobody has been able to take anything with them. You too look around. If you find anyone being able to take anything with them, do let me know.” Seetha’s wisdom is elementary and, therefore, unputdownable. I think Kapoor (and his fight over the Bean) is but a metaphor. There’s a Kapoor in each of us. We are often clinging on to people, relationships, ideas, opinions, IPRs, property, money and what not. And through each act of clinging on, and with each avoidable battle we fight, we are suffering. The only way to escape all that suffering is this: soak in Seetha’s philosophy. If you can get it into you, and have it stay there, well, you are home! Enjoy your Sunday, meanwhile, this one isn’t ever gonna come back! Author AVIS ViswanathanPosted on September 13, 2015 March 14, 2016 Categories Anish Kapoor, Art of Living, Bean, Don't Cling On, http://schemas.google.com/blogger/2008/kind#post, Inner Peace, Intelligent Living, Karamay, Let Go, Osho, University of ChicagoLeave a comment on If you can soak in Seetha maami’s wisdom, you are home!